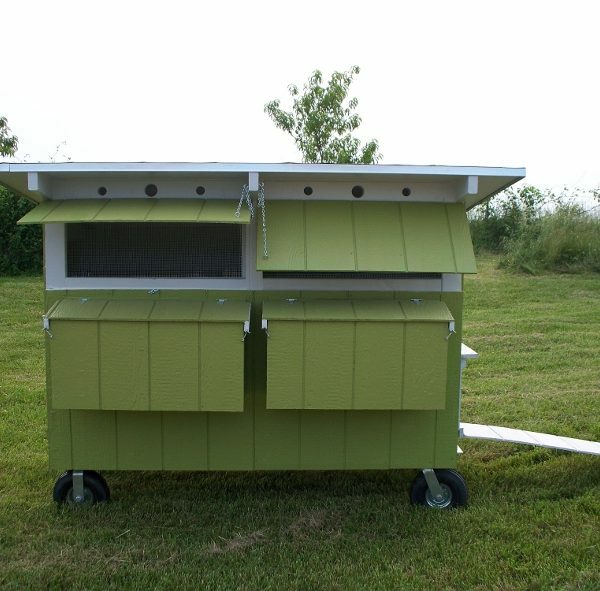 Perfect for housing a larger flock! Low Cost and Easy to Build! Everything you need in a coop! How about a chicken coop that is attractive, easy to maintain, and is just the right size to house your small flock of backyard chickens, a hatchery “Eggs & Meat” special or even a few turkeys? 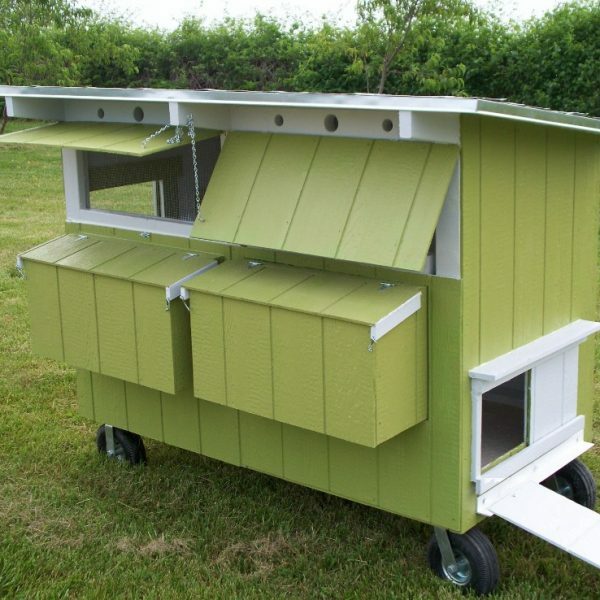 What if that coop could be used as either a stationary hen house or a mobile pastured poultry ark? (You could make full use of free range forages!) Then, what if I told you the coop could be easily adapted to suit YOUR personal needs AND it was LOW COST? 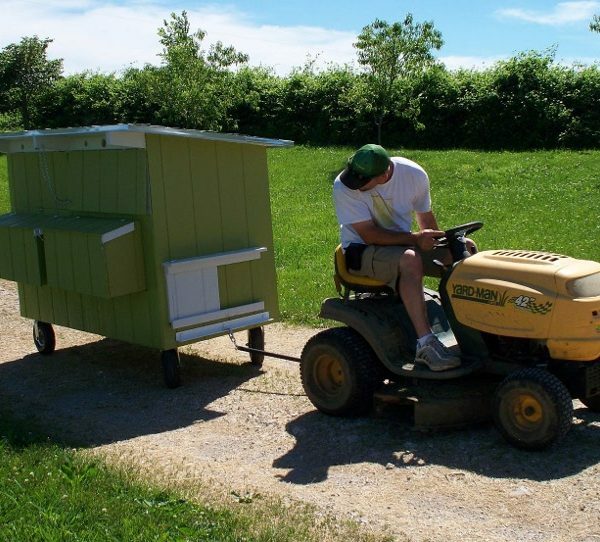 We decided to meet the challenge and the City Biddy Double WIDE Poultry Coop was born! Every chicken needs a shelter that is safe from predators and protects them from the weather. 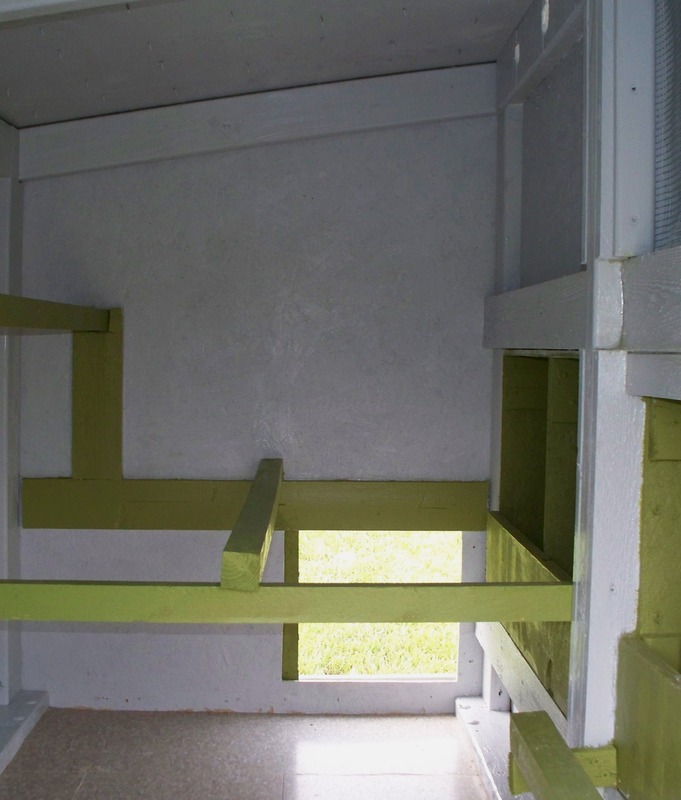 The solid construction and compact size makes our Double WIDE coop comfortable safe home for your hens year round. Cool in summer and warm in the winter, it provides your flock with the healthy living conditions that they need to thrive. When latched closed at night, the coop provides good security for the flock as well. 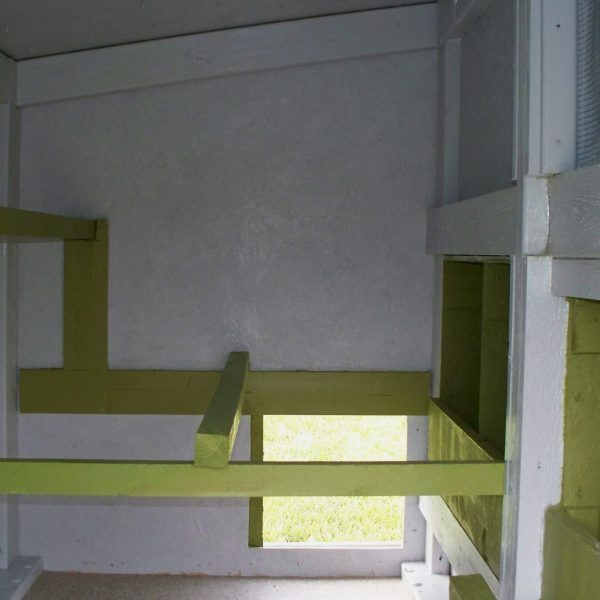 No more mid-night raccoon hen house raids! 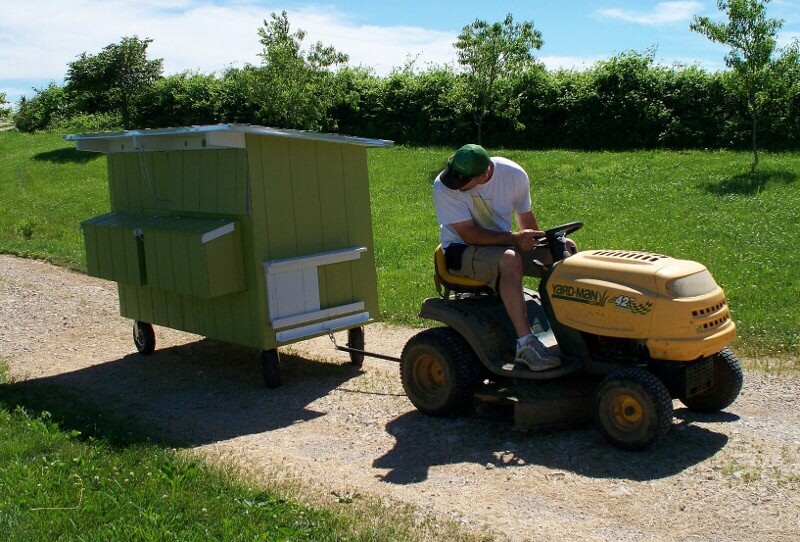 Every flock keeper needs a coop that makes work easier and faster. 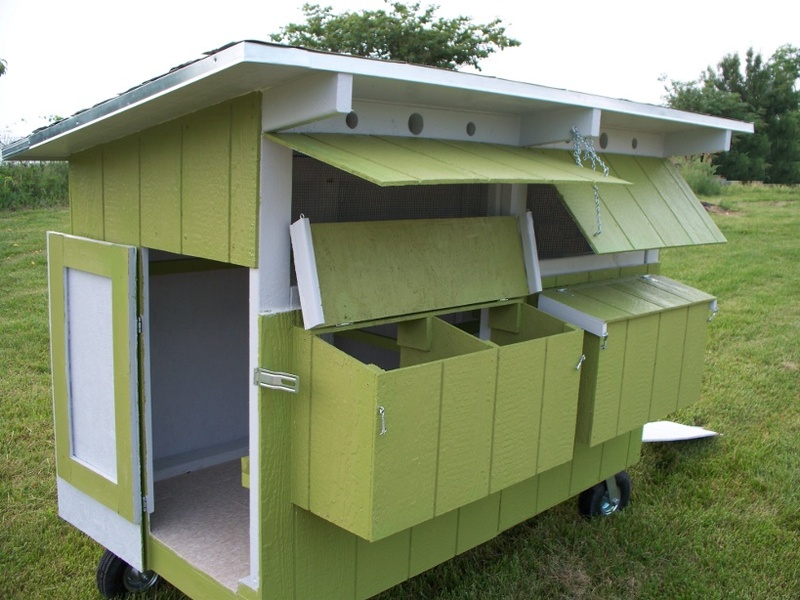 No stooping or crawling involved in caring for your chickens in a Double WIDE coop. The large access door makes feeding and cleaning a breeze! 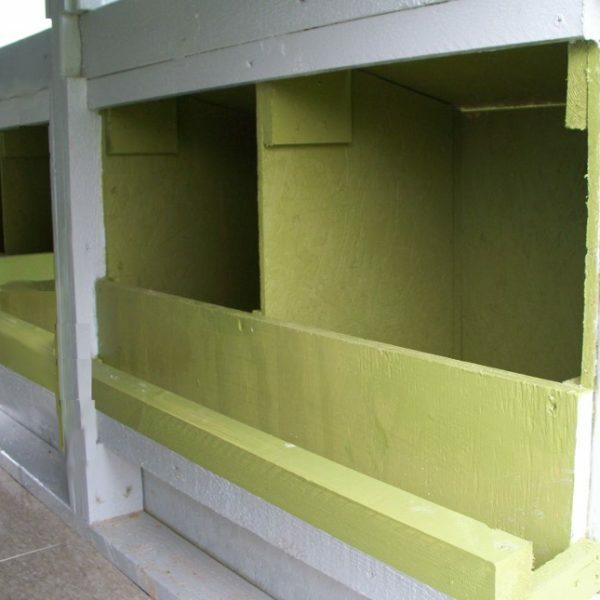 The four roomy exterior nest boxes, which are perfect for around 15 full size adult hens, make egg collection easy. All care takes place from outside of your eye catching coop. 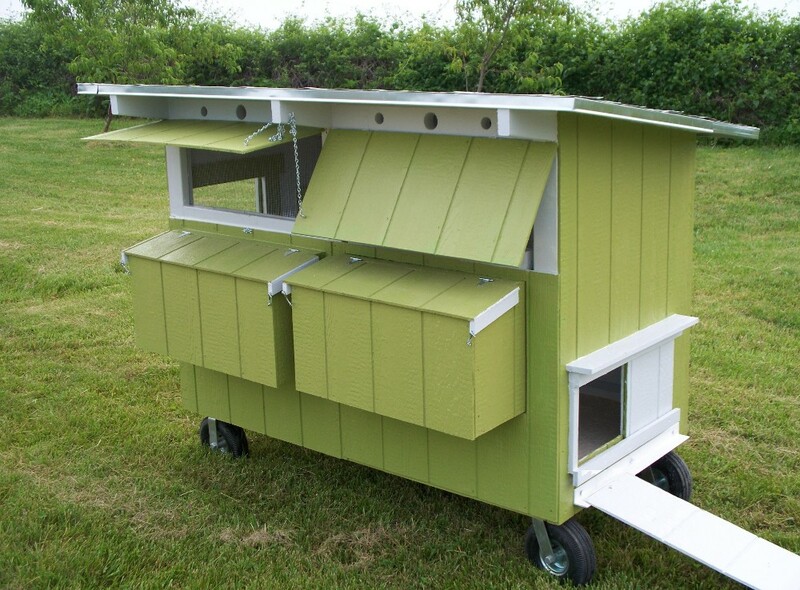 The City Biddy Double WIDE coop is an ideal pastured poultry coop. It is easily moved by two adults from place to place to take advantage of fresh grass. 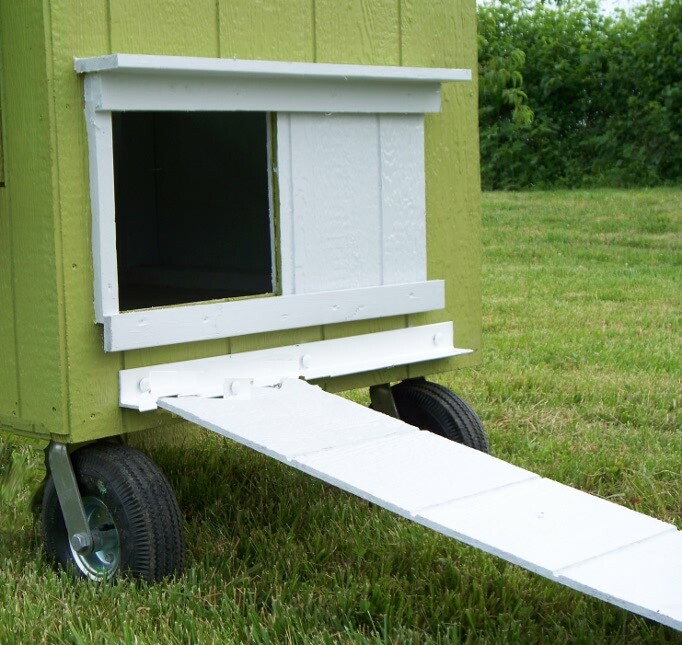 We recommend the coop for around 15 adult large breed chickens, but short term you can house a few more. Now you can take advantage of those “Eggs & Meat” specials that the hatcheries offer. 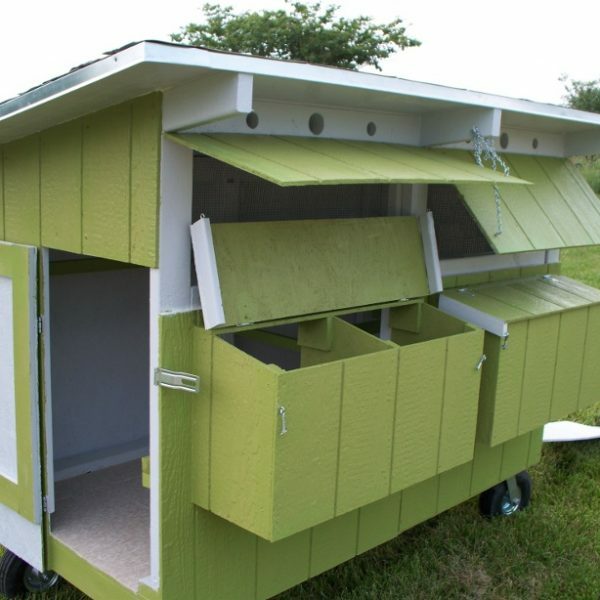 The Double WIDE is roomy enough for all 25 birds, until the “meaties” are old enough to send to the frying pan! 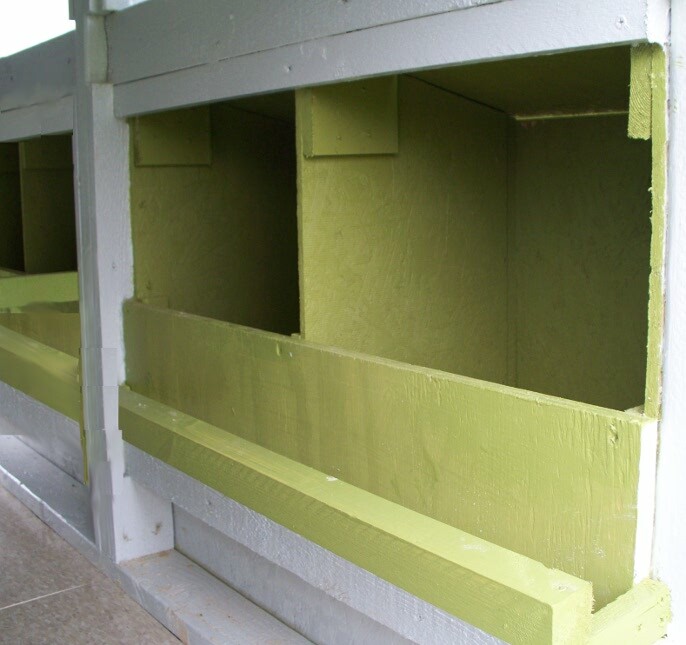 With a bit of adaptation to the basic design, the coop can be used for housing turkeys, broilers or even water fowl. Since you build the coop yourself you have lots of freedom to make the coop exactly suit your needs. Building the City Biddy Double WIDE coop yourself saves LOTS of money! If you want save even more make a green choice and use reclaimed materials! Our building plans make it easy to have the coop you need – for a price you thought you could only dream about! uBuilder plans make it easy! This is NOT a download. Our 33 page color building plan book includes: professionally designed measured drawings, detailed step-by-step instructions written for easy assembly by almost any handy person, color photos, and a section on poultry care. We even provides you technical support by e-mail! 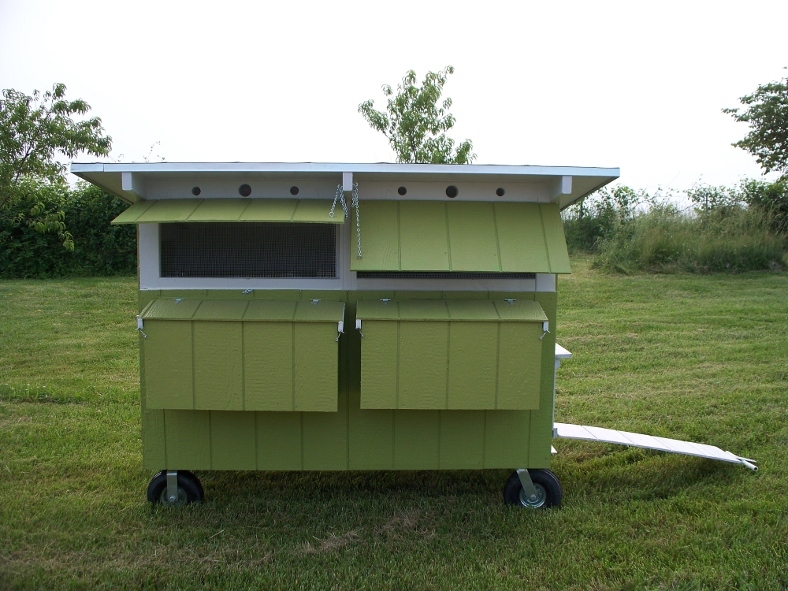 Finished coop dimensions: 3 ft x 6 ft x 51 inches tall – 18 sq ft of interior space and 4 nest boxes.